Scalable framework to support Big Data models. Dynamic data models by integrating data from any sources including Google big query, social networks, device sensors, etc. Any data in any format. 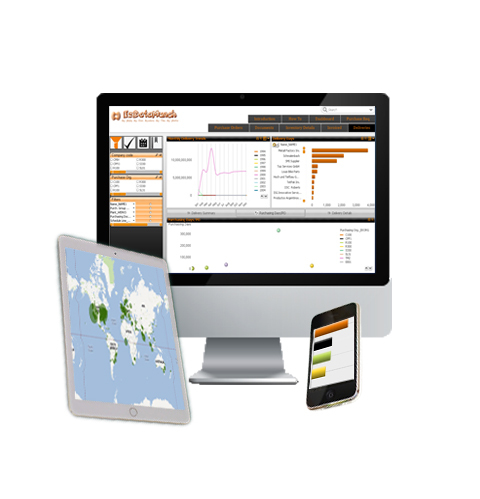 Visually simple, KPI driven dashboards and analysis. Functional domain expert driven App design. Business function specific or industry specific metrics and analysis. Functional areas include Customer care analysis, Social media listening posts, Customer reviews analysis, sentiment analytics, market and political dynamics analysis, Mobile Application analytics, etc. In-memory analytics and storage for better storage optimization. Listen to what your customers are calling about. Are they angry? Are they asking for help or are they trying to place an order? for which product or service they call often? Which store location they call and why they call? What time of the day or hour they call? How the call was handled? Did it transfer correctly to the agent? If so, how many attempts it took to transfer it to the right agent? Whether the call was Contained? It it was not, when it was Abandoned? How many questions were correctly answered during the call? What is the script performance? Our App can provide you all the insights in almost real-time basis as the calls land at your call center! With 1.2 billion people using Facebook, Twitter, Linkedin, Foursquare, Yelp and other social media websites…they generate a lot of content…If you are a retailer, insurance company, a bank, a non profit, a government agency – there is one thing in common – you want to know what people are talking about and what are the trends! There is another aspect to this whole social media madness! What people talk about you, how employees perceive your company’s brand, its image as employer, what they talk about your product and services, whether they will respond to surveys, how they see you against your competition, how they will react to your next marketing communication and business decision to merge or acquire a company…all this can be analyzed using EzDataMunch Apps if you want to LISTEN! Welcome to our Listening post Apps! They provide you detailed analysis of posts from various websites, blogs, generally on internet, political tickers, economic and social trends, data from your Facebook and Twitter accounts, from your competition, product and services and what people talk about it, how they perceive it and build impressions! 1. Patient recovery analysis across providers. 2. Provider analysis for efficiency, type of care, bed utilization, etc. 3. Time series analysis of patient symptoms for predicting health issues going forward. 4. Research on obesity analysis. 5. Fraud detection in medicare and medicad. 6. Claim process efficiency analysis across multiple payers to determine why and how claims result into legal disputes. EzDataMunch partners with Government and Semi-Government entities such as counties, cities, State and Federal Government, Universities, Colleges, School districts and nonprofit organizations to carry out multiple research objectives. We have one mission – to provide the best data analysis possible so that the care and well being of citizens can be continuously improved year over year. We provide FREE assistance in some of these programs and would love to partner with you. 2. Service / Customer care analysis. 4. Research like Accident analysis, health analysis, Economic development, migration, Education, law enforcement related data, etc. 1. To measure the downloads across multiple stores or for a specific store with various time series analysis. 2. Revenue shared – whether it is a shared revenue, or in App purchase or Ad revenue – you can see all in one dashboard. 3. Ad performance – How are the Ads performing within your App, which Ads users like, when they click, etc. 4. Ranking Analysis across multiple App stores – In the specific sub-category and category and also across the all the App available in that App store – Free / Paid / Gross. 5. Customer reviews – How to make your Mobile App experience better, what customers are saying about your App, do they like some other Apps in the same category – get better insights to help you decide what will be the next version of your Mobile App. 1. Easy slicing and dicing of various customer segments and associations between various data points that you may have in your data sets including Geo location data. 2. Correlations and patterns within how consumers move between a specific Geo Fencing radius. 3. How are they using their smartphones during special events like Superbowl, NBA championships, bad weather days, holidays, weekends, etc. 4. Which Apps consumers are using the most? It helps you to put targeted content or slice them effectively into various buckets for various marketing and Ad targeting activities. 5. Favorite places visited on a time series scale and much more. We never imagined that we can find out some much from the consumer reviews generated on internet and blogs that give a real insight into what our customers are thinking. This changes everything – how we market our products, how we run our stores, how we price them and our future plans! The business impact of such a magnitude at such a low cost – this is the best example of ROI I have seen in my whole professional career.